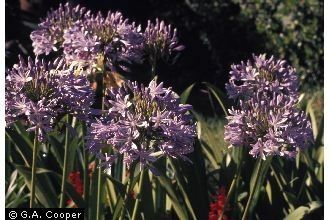 The common names for the Half Hardy perennial Agapanthus include African Lily, Blue African lily and lily of the nile. They typically flower in the summer. Agapanthus plants can have stalks from 60 to 120cm in height. 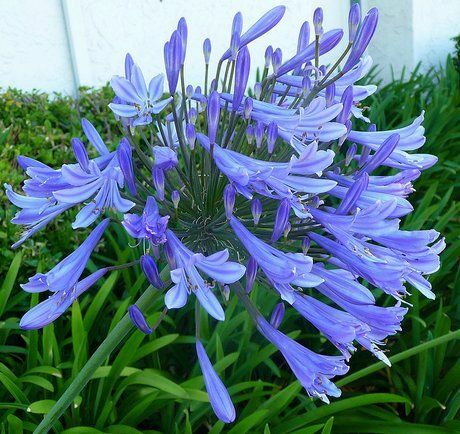 The African lily has funnel shaped white or blue flowers, and thick strap like leaves. Common Names: African Lily, Lily of the Nile Plant, Blue Lily. Main Species: Agapanthus africanus; Agapanthus campanulatus; Agapanthus caulescens; Agapanthus coddii; Agapanthus inapertus; and Agapanthus praecox. Cultivars: There are hundreds of Agapanthus cultivars and hybrids available, examples include 'Albovittatus', 'Bressingham White', 'Liliput', 'Loch Hope', 'Northern Star', 'Purple Cloud', and the Agapanthus Headbourne hybrids. Height: 24 to 48 inches (60—120 cm). Growing Region: Zones 8 to 10, grow in containers in cooler areas. Flower Details: Blue, purple, white. Funnel-shaped. Pseudo umbel of up to 100 tiny florets. Foliage: Herbaceous. Monocot. Basal leaves. Linear/strap-like, curved. Up to 24 inches (60 cm) in length. Seeds: Cover seed. Following the last frost. Seed grown plants typically take four years to first bloom. Bulbs: 2 inches (5 cm). Pointy end up. Cover with soil and then firm it. Plant Agapanthus bulbs in the spring once the temperature has reached 55°F (13°C). As bulbs will not start to grow until they reach this temperature they may be subject to rot if planted too early. Sow Inside: Germination time: three weeks to three months. Temperature: 60 to 70°F (15—21°C). Space at 18 to 24 inches (45—60 cm). Requirements and care: Full sunlight for best results, or partial shade (Do not plant new crowns in the shade). Good drainage (drainage can be improved by adding sand or rotted manure). Moist soil. Regular watering. Fertilize once a fortnight. Deadhead to encourage longer blooming. 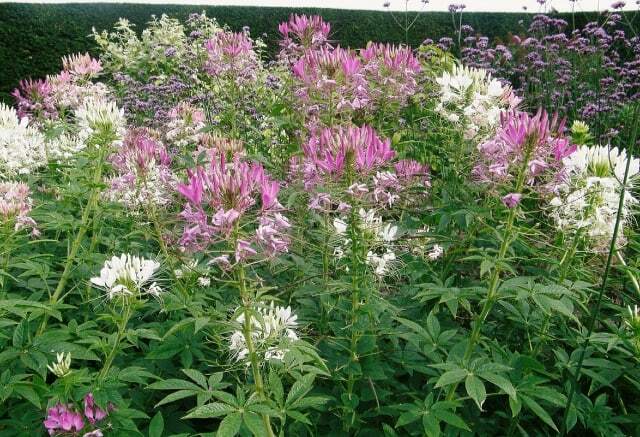 Once blooming has finished do not cut back foliage and provide light watering. Yellow, decaying foliage can be removed when it appears. Use a dry mulch (straw/sand) or in colder areas, lift bulbs from containers, trenches before the first frost and bring inside, store in trays of dry sand in an area that is free of frost. Miscellaneous: Named after the Greek words for love (agape) and flower (anthos). Invasive species in many areas, considered a weed in New Zealand. It is best to sow African Lilies and Lily of the Nile Plant seeds just below the soil surface (bulbs at a deoth of 5 cm), with a spacing of 45 to 60 cm after the last frost of spring. African lilies prefer light shade or full sunlight. The soil should be well drained and moist. Agapanthus species require between 20 days and 90 days to germinate. 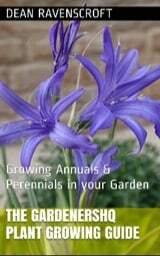 If first growing Agapanthus indoors then they should be sown in an area that is at a temperature of 15 to 21 degrees centigrade. Agapanthus care is pretty easy as the Lily of the Nile Plant and Blue African lilies are fairly easy to care for, they require regular watering and should be fertilised every couple of weeks whilst growing. When grown from seed African lilies may take as long as 4 years of growth before they flower. The plants should be deadheaded, to maintain yearly healthy blooming.